Libra is represented by Scales. Interestingly, Libra’s symbol is the only one in the zodiac that is inanimate (not represented by a person or animal) and they tend to be objective rather than emotionally-based when making judgments. This makes them good at law and they are often drawn to the study of law in one of its forms. Scales are the symbol of justice and they also weigh and measure things as do Libra natives. They seek peace, harmony and balance. Society needs rules in order to be civilized and evolved Libra brings justice, fairness and equality. Libra is a masculine cardinal air sign ruled by Venus. While this planet is associated with love in all its forms, a higher expression is divine harmony. Venus is the harmony that brings out the beauty in a person or object through the healing energy of love. It is often the case with Libra, the sign of relationships and partnerships, that they find themselves helped by other people and are more fortunate as part of a pair. Whereas the job of the opposite sign to Libra, Aries, is to learn independence and to find themselves, the job of Libra is to learn about teamwork and compromise. This Sun sign is fair, just, diplomatic, sociable, civilized, refined, romantic, and charming, easy going, sociable, idealistic, peace-loving and artistic. The downside of all this charm and pleasantness is a lazy streak. Although they are active and energetic, they also like to be indulged and pampered and dislike dirty, coarse work. Unlike their opposite sign of Aries, they are lovers not fighters. Eager to cooperate, they spend a lot of time and energy trying not to rock the boat. Other negative Libran character traits include frivolity, shallowness, and being lazy and indecisive with sudden outbreaks of anger. Their love of pleasure can lead them to become reckless and careless about money. They also can be great gossipers with an insatiable curiosity for scandal. photograph copyright Gary Blaze. 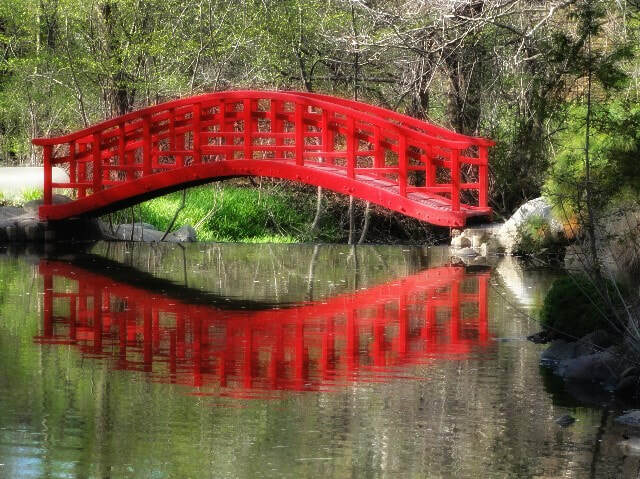 Red Bridge. All rights reserved.